Orrin Hatch (born March 22, 1934) is a former U.S. Senator from Utah. He is a Republican and a Mormon. After the Republicans won control of the Senate during the 2014 midterms, Hatch became President pro tempore on January 6, 2015 after the 114th United States Congress was sworn in. On January 2, 2018, Hatch announced his retirement from the Senate after low approval ratings. Hatch was born in Pittsburgh, Pennsylvania on March 22, 1934. His parents were Jesse Hatch and Helen Frances. Hatch studied at Brigham Young University and at the University of Pittsburgh. He worked as an attorney in Pittsburgh and in Utah. In 1976, in his first run for public office, Hatch was elected to the United States Senate, defeating Democrat Frank Moss, a three-term incumbent. Among other issues, Hatch criticized Moss' 18-year tenure in the Senate, saying "What do you call a Senator who's served in office for 18 years? You call him home." Hatch argued that many Senators, including Moss, had lost touch with their constituents. Hatch himself has now been in office for 40 years. Hatch has been a longtime advocate of amending the United States Constitution to require that total spending of the federal government for any fiscal year not exceed total receipts. He proposed the DREAM Act, which would provide a pathway to citizenship for the children of undocumented immigrants, who were children when their parents came to the United States. 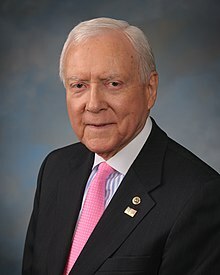 Senator Hatch co-sponsored the Restoring the 10th Amendment Act (S. 4020 111th Congress), which would strengthen state rights under the 10th Amendment. The bill would provide special standing for state officials in challenging proposed regulations. In 2018, Hatch announced that he would retire after seven terms in the Senate. Hatch has long expressed interest in serving on the U.S. Supreme Court, but due to his age decided not to express any interest anymore. It was reported that he was on Ronald Reagan's short list of candidates to succeed Lewis F. Powell, Jr. on the United States Supreme Court, but was passed over at least in part because of the Ineligibility Clause. Despite that, he vocally supported Robert Bork, who was chosen instead. After Bork's and Douglas H. Ginsburg's nominations to the seat faltered, Anthony Kennedy was confirmed to fill the vacancy. In 2000, Hatch made a failed bid for the Republican presidential nomination, losing to then-Texas Governor George W. Bush. During the first Republican debate, Hatch made web usability a campaign issue, a first for a presidential candidate. He claimed his website was more user-friendly than Bush's. At least one web usability expert agreed. Hatch married Elaine Hansen on August 28, 1957. They are the parents of six children. Hatch is a member of The Church of Jesus Christ of Latter-day Saints. Hatch serves as a member of the board of directors of the United States Holocaust Memorial Museum. In November 2018, Hatch received the Presidential Medal of Freedom from President Donald Trump. ↑ "Early Life and Family Gallery". Retrieved 28 July 2011. ↑ Davidson, Lee (5 October 2005). "Wine, beer, liquor cash flows into Hatch coffers". deseretnews.com. Deseret News. Retrieved 28 July 2011. ↑ Martin, Jonathan (January 2, 2018). "Orrin Hatch to Retire From Senate, Opening Path for Mitt Romney". New York Times. New York, NY. ↑ Richard C. Young (February 24, 2012). "Time to Vote Dan Liljenquist, and Dump Orrin Hatch". RichardCYoung.com. Retrieved February 11, 2013. ↑ Haddock, Marc (March 22, 2010). "On Orrin Hatch's 76th birthday: his career in photos". Deseret News. Retrieved July 28, 2011. ↑ Orrin Hatch (June 10, 2010). "Hatch Lauds Passage of FISA Modernization Act". Press release. http://hatch.senate.gov/public/index.cfm?FuseAction=PressReleases.View&PressRelease_id=0d432a46-1b78-be3e-e0e4-97855ddb539b. Retrieved November 5, 2010. ↑ Jamshid Ghazi Askar (January 27, 2011). "Sen. Orrin Hatch sponsors balanced-budget amendment for 17th time". Deseret News. ↑ "Hatch pushes balanced budgets — again". The Salt Lake Tribune. January 16, 2011. ↑ "Bill Summary & Status – 107th Congress (2001 – 2002) – S.1291". THOMAS (Library of Congress). Retrieved January 22, 2012. ↑ "S. 4020 (111th): Restoring the 10th Amendment Act". govtrack.us. Civic Impulse. Retrieved July 10, 2011. ↑ McCarter, Joan (January 2, 2018). "Orrin Hatch announces retirement from Senate". Daily Kos. Oakland, CA. ↑ Beth Marlowe (February 4, 2011). "Why He Matters". Who Runs Gov. The Washington Post. Retrieved February 14, 2011. ↑ Molotsky, Irvin (June 28, 1987). "Inside Fight Seen over Court Choice". New York Times. ↑ Noble, Kenneth B. (September 11, 1987). "Hatch Assails ABA over Vote on Bork". New York Times. ↑ "Orrin Hatch". NNDB. Retrieved January 22, 2012. ↑ "Orrin Hatch". Juggle.com. Retrieved January 22, 2012. ↑ "Trump To Honor Antonin Scalia, Orrin Hatch, GOP Megadonor With Medals Of Freedom". HuffPost. Retrieved November 12, 2018. Wikimedia Commons has media related to Orrin Hatch.